Adware and other potentially unwanted program may spread with the help of Danabing. It is offered as software-downloader tool that applies highly optimized process resulting to faster downloads and better user experience. In general, Danabing was made to monetized software installation. It helps distribute various programs by embedding them into single installer file known as software bundle. In most cases, Danabing may arrive on the computer packed with several applications. Some are useful, but there are cases that adware is also bundled with it. This scheme is the easiest way for adware makers to deploy their product. On the other hand, Danabing authors see this opportunity to generate online profit. When Danabing starts to install on the computer, other programs are similarly loaded in synchronized manner. Users are not aware of this because it occurs in the background without any notification. This process not only installs several applications, it also alters settings on the browser. Homepage and default search engine configuration are most affected by these changes. Due to a number of unwanted programs added on your Macintosh system, it greatly affects system performance. Internet connection speed can be sluggish at times since there are adware that constantly operate online to download more unwanted apps. Danabing may also monitor and record your internet data and occasionally send the logs to a remote server. As you can notice, it is not healthy for your Mac system to have a potentially unwanted program such as Danabing. To prevent any further damage and avoid installation of additional adware, we highly suggest immediate removal of this questionable program. Execute the guide below to totally remove Danabing and other relevant malicious programs. Combo Cleaner is a trusted Mac utility application with complete antivirus and optimization features. It is useful in dealing with adware, malware, and PUP's. Moreover, it can get rid of adware like Danabing. You may need to purchase full version if you require to maximize its premium features. 5. Wait until antivirus downloads it's latest virus definition updates and click on "Start Combo Scan" to start removing Danabing. 2. Once you have located Danabing, click on Remove or Uninstall, to get rid of it. If you cannot find the specified file, please look for any unfamiliar or suspicious entries. It may be the one causing Danabing to be present on your Mac. Arranging all items to see the most latest ones may also help you identify recently installed unfamiliar files. Please press Option + Command + 4 on your keyboard to arrange the application list in chronological order. 4. You may now delete or remove locked files that belongs to Danabing adware. 2. Run Malwarebytes Anti-malware for Mac. It will check for updates and download if most recent version is available. This is necessary in finding recent malware threats including Danabing. 5. 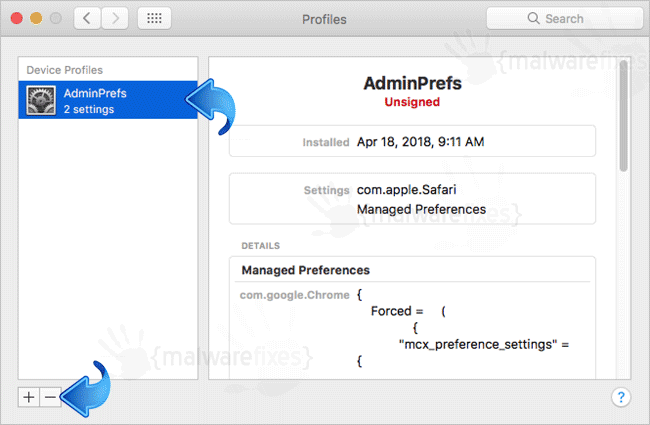 After the scan, Malwarebytes Anti-malware for Mac will display a list of identified threats, Danabing is surely part of it. Be sure to select all items in the list. Then, click Remove button to clean the computer. - Lastly, remove Danabing from the Homepage field. Replace it with your preferred URL to be set as your default homepage. - Enter the desired web address as your home page, replacing Danabing. Click Save. - Under Home Page field, type the desired URL to replace Danabing settings. 3. Select Danabing or any relevant profile from the left pane. See image below. 5. Close the Profiles window and open the affected browser to change all settings associated with Danabing.